The Lower Pearl River in Pearl River and Hancock Counties Mississippi is the boundary between Mississippi and Louisiana. 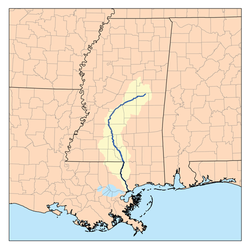 The Basin has two river systems; the Pearl River (sometimes referred to as the “East Pearl”) which separates Mississippi and Louisiana and the West Pearl which flows through Louisiana. The two rivers are connected by numerous branches, sloughs and bayous that flow westward from the Pearl River to contribute flows to Louisiana’s West Pearl River. During low- flow periods, 85-90% of the Pearl River’s flow was diverted into the West Pearl River because of construction, neglect, and the Pearl River’s normal actions. Without some action, the Lower Pearl River would soon cease to flow in Pearl River and Hancock Counties. 3. Excavate a channel on the Pearl River downstream of Wilson Slough. The COE completed construction of the project in late 1998 and turned the project over to the PRBDD to operate and maintain. The federal government through the COE provided 100% of the project’s study and permitting costs of $749,150. The $4,166,893 design and construction costs were split 75/25 with the federal share being $3,125,170 and the sponsor’s share being $1,041,723. However the Wilson Slough weir was seriously damaged by high water almost immediately and the COE had to assume responsibility for the project again in early 1999. The weir was seriously damaged again in 2002. The federal government assumed 100% of the $4,730,866 repair costs. Despite the repairs, the project has never been able to meet the design goal of 50/50 low-flow allocation. As of late 2010 the COE reported that the project had only been able to achieve an 85%/15% low-flow allocation between the Pearl and the West Pearl Rivers. As the project’s local sponsor, the PRBDD has attempted to get the COE to re-evaluate and re-design the project to meet its design goals. In 2015, the PRBDD applied to the COE for $100,000 of Continuing Authorities Program section 1135 funds (Project Modification for Environmental Benefit) to investigate the project and determine what modifications would be necessary to achieve the original 50/50 low flow allocation. The PRBDD and the Pearl River County Board of Supervisors are working together with Mississippi’s Congressional Delegation to ensure that the COE funds this important project in 2017. The PRBDD retained the Pickering Firm to provide technical services for this important regional project to ensure that the Lower Pearl River’s minimum flows continue supporting important ecological, environmental and recreational needs. This is really important. I have somehow missed the news of these developments until reading this blog. MWRA needs to highlight the project and issues at our fall conference.